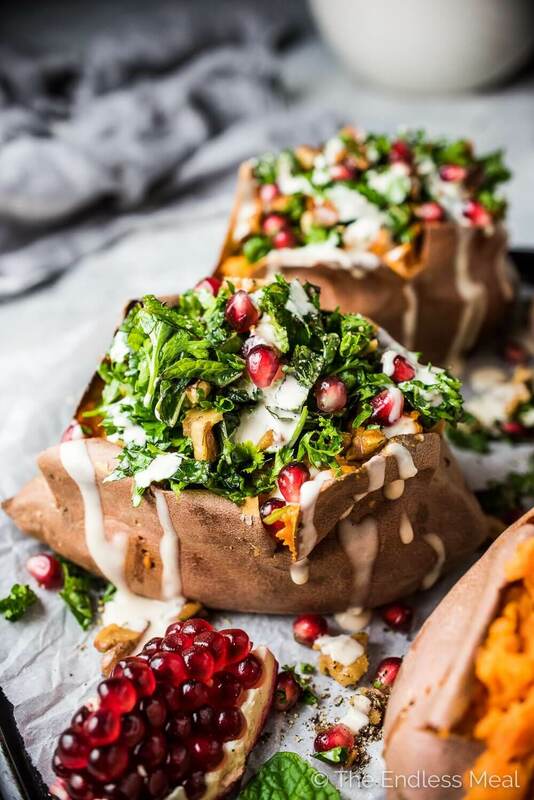 Get a taste of the holiday season with these stuffed sweet potatoes! The pomegranate give them a cozy, winter-y feel that is perfect to serve as a fun side dish or enjoy during a quiet night in. Turn your oven to 400 degrees. Prick the sweet potatoes 5-6 times each with a fork then set them on the baking sheet. Place them into your oven (no need for your oven to preheat first) and bake them for 45-60 minutes, or until they are soft. Remove them from the oven and set them aside to cool slightly. While the sweet potatoes are baking, prepare the topping. Place the walnuts, mint, parsley, and pomegranate in a medium-sized bowl, drizzle with the olive oil and toss to combine. Whisk the Tahini Lemon Sauce ingredients in a small bowl adding enough water so it is the consistency of honey. When the sweet potatoes are cool enough to handle, cut through the skin in a T shape. Gently mash the insides then pile the walnuts and herbs on top and drizzle with some Tahini Lemon Sauce. Recipe analyzed without sea salt, to taste.